Leading off today: Addison Wallace scored twice as Fabius-Pompey defeated Bishop Grimes 3-0 on Wednesday in a matchup of state-ranked and undefeated Class D boys soccer teams from Section 3. Jameson Andrews contributed two assists and Kewan Trotman added his 17th goal of the season for Fabius-Pompey, ranked second by the New York State Sportswriters Association. Bishop Grimes is ranked 14th. Trotman has scored in all eight of his team's contests this season. Girls soccer: June McCarthy scored with 34 seconds to play as newly ranked Johnsburg edged Willsboro 2-1 . 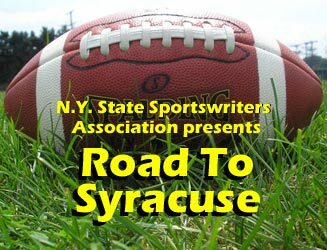 The Jaguars were ranked ninth in Class D by the New York State Sportswriters Association of Tuesday night. (Full rankings here.) Coach Ryan Carpenter shared the honor with his team before the game. "Then after the game I told them it might not be what they're used to, but now it's an expectation that has to be met and embraced to play at that level," Carpenter said. Milestone: Little Falls senior Nicole Failing notched career goal No. 100 during an 8-1 victory against West Canada Valley. Failing has five goals and five assists this season on the heels of a 45-goal junior season. Big weekend ahead: The schedule for Week 4 of the New York high school football season is loaded with head-to-head matchups between ranked squads, which will certainly cause juggling in next week's set of state ratings. Tops amongst the 17 contests pairing ranked teams figures to be No. 3 Victor vs. No. 7 Irondequoit in Section 5 Class A action. Possibly the most intriguing game pairs No. 9 Iona Prep with No. 16 Cardinal Hayes in CHSFL Class AA action. Iona Prep already has a pair of wins under its belt, while Hayes is making its season debut after opening with a bye and having its Week 2 game scrapped when an out-of-state opponent canceled late in the summer. On the move: Julian Cunningham, ninth-team all-state for Bishop Timon-St. Jude in boys Class A basketball as a junior last season, is leaving the country. The Buffalo News reports Cunningham announced on Twitter that he will attend Orangeville Prep in Ontario, Canada. The 6-foot-1 guard intends to reclassify to the class of 2020. Cancer diagnosis: Alex Officer, a pulverizing offensive lineman who was first-team all-state for Eastridge in 2012 and went on to an outstanding career at Pitt, has been diagnosed with cancer. Officer has osteosarcoma, a common type of cancer that forms in bones, his agent confirmed this week. Officer noticed a pain in his knee that turned out to be a symptom of his cancer while working out for the Kansas City Chiefs, Chicago Bears and Oakland Raiders this summer. A GoFundMe page started by Officer's brother raised $37,000 (with a goal of $100,000) in just over a day after being mentioned by Pitt coach Pat Narduzzi. Coaching news: Dave Cook has stepped down as boys basketball coach at Stillwater after 238 victories in 17 seasons and will be replaced on the bench by veteran assistant Bruce Lilac. • Former Carthage boys lacrosse coach Kirk Ventiquattro will be assisting his son Tony at Fort Myers, Fla., Bishop Verot next spring. Kirk Ventiquattro's Carthage teams won 24 league and six Section 3 championships.